I had an AHA moment today with my money honey. The thought that popped into my head recently was “I am never getting paid again” – meaning that I was letting go of the mentality of “getting paid” for something – and that what was really at the heart of the transaction of currency was really my relationship with money – that all that matters really is how am I and money doing? It feels deeply liberating to live this way – the stress of trying to “get paid” is actually a similar kind of stress of trying to “get laid” – there is an objectification that happens with that that’s not only stressful but does not stress relationship or intimacy and no one ends up deeply fulfilled. When the relationship becomes the only thing that is focused on, then money coming in and out feels so much more EFFORTLESS and FUN – and I feel a very deep freedom in my life to follow my dreams – my money honey is also pushing me to live my dreams – before I wouldn’t do something out of the box if I wasn’t getting paid for it – now if my money honey tells me to do it I don’t care if I am getting paid or not – and wouldn’t you know that money comes in so easily that I hardly have to put any effort into it. Last week both my husband and I commented that everything was so effortless that it was almost like I wasn’t working – but when I added up the income I had an extremely successful week – I actually added up the numbers a few times because I could hardly believe it! But now I am a believer! “getting paid is like getting laid” — I love it! Thank you for a new twist on the whole thing. I had my breakthrough a few weeks ago where simply asking my MH every week “What do you want me to do this week to make you happy?” is such a not-ME question. I don’t turn to my live-in boyfriend and say that. I go over, I rub his chest, ask what he’s up to, how he’s feeling, get a hug, cuddle at night, spend time together, occasionally watch a movie, etc. 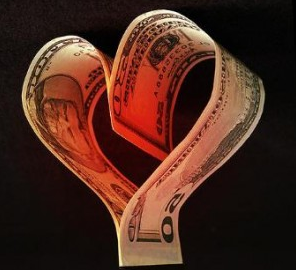 I realized that I spend time with my honey every day, so I’d better spend time with my money honey every day too. Now we sit and read my website together, collaborate on content, talk about the book I’m writing, or pour over my offerings and packages together. We watch or listen to educational business-building teleseminars together, and he takes a real interest in what I’m doing with my business. Thanks for a hint on taking my relationship with my money honey a step forward. i have returned today from a 2 night indulgent get-away with my money honey. our time together was inspiring! He and I created my next personage for an upcoming performance. From a- z we played in make-up, costume, dance moves, and stage name! SO MUCH FUN! I loved creating with him because i felt whole in the experience. I am now back from our trip and fearing the opportunity ahead. I will overcome the fear, this i know, because with money honey I live in truth. Time has become precious once again. The idea of money honey for me is exactly like this article. I feel effortless and fun. It feels to me like a burden of proving myself was lifted. Like Morgana I consider myself as expert in my field, and I made excellent money in one aspect but the other — I failed. The failed one was the one I tried really hard to succeed. The other day I asked my money honey for a proof of his love and voila I got it. 100 times more than I normally made that day. My husband was shocked and he told me to come to his office to show me. Well my money honey also is telling me he is happy with me and that he will bring me more money for the trip to my homeland. This is a relationship made in heaven. Thank money honey for your love. Thanks to you and several other life coaches, I feel like I just came out of a cave in relationship to my relationship with money. Because I so lived long enough with my Money Monster, I didn’t trust nor grasp that I had a Money Honey who loved me and would only do right by me, when consulted. Thank you for this article today. We already know the answer to that question based on our own intuition, but I can see how it would be really helpful to consult our Money Honey; it’s like taking a step backward (really forward) and contemplating the question from a different perspective which often gives us the permission to follow our own intuition in the first place. Thanks for sharing. » Previous Post: [VIDEO] Secret Money Attraction Strategy: GIVE testimonials! » Next Post: How do you get comfortable charging what you’re worth?